Holidays in your homeland are accompanied with a welcome gift. Rent 7 days and pay only for 5 ! The 5 days package applies directly on a 7 days rental; with an unlimited mileage. Offer subject to conditions and may be changed without notice, not combinable with any other promotion, subject to car availability. Rental terms and conditions of Europcar Morocco will apply. Europcar is the specialist in car rental in Morocco and around the world as well. To suit your needs in terms of movement, Europcar offers in Morocco different ranges of vehicles : car hire for your occasional or regular travel, vehicles for major events like vans, four wheel drive, …. 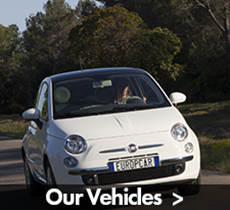 Europcar Maroc offers any type of vehicles, from small to large, and specific ranges. Car rental in short, medium and long term is our mission ; cars and services are our passion ; do not hesitate to contact us for more information on our different products.